Unlike asthma or Chronic Obstructive Pulmonary Disease (COPD), tuberculosis disease has a known cause. It results from infection by a bacterium known as Mycobacterium tuberculosis. While secondary infections are more likely when a person has COPD, due to the tendency to retain excess mucus, the bacterial infection itself is the primary cause of TB. The symptoms of tuberculosis disease are also very different from the likes of asthma and COPD. Coughing is common in both types of lung disease, but in TB, this is accompanied by the coughing up blood, severe chest pain, fever, and night sweats. While chronic obstructive pulmonary disease creates shortness of breath and sometimes fatigue from difficulty of breathing, tuberculosis is often fatal if left untreated. Fortunately, there are simple tests that will detect the presence of the germ. One common one is, happily, much less well known now than in generations past thanks to many fewer cases. During a skin test, a doctor injects a small amount of special fluid into the lower arm. The arm is checked some forty eight to seventy two hours later for a characteristic swollen and reddened appearance at the site of the injection. It results from the interaction of the germ with the fluid, which contains deactivated tuberculosis proteins. However, the test can only detect the presence of the TB-causing organism, not the disease itself. A condition called latent tuberculosis is where the germ lies dormant in the body without causing any illness. Follow up tests, such as an x-ray examination and sputum analysis, are performed when the skin test is positive. X-rays may show scarring (fibrosis), as the body wraps the germ in scar tissue, or calcification (hardening) in the lungs. Sputum analysis can directly detect the presence of the bacterium by using a special stain or dye. When the germ is still dormant, it may reside in the lungs but will generally be absent from sputum. Although unlikely, it is possible to house the organism and never develop full-blown tuberculosis disease. 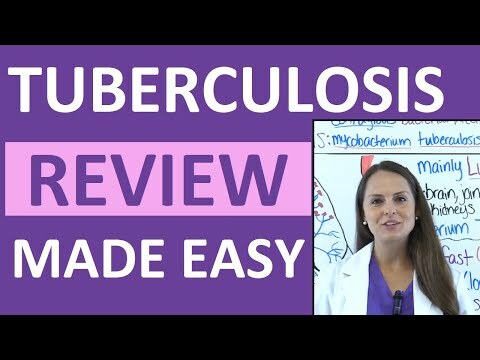 However, the longer the germ is retained without generating symptoms, the lower the odds of ever developing active tuberculosis. Since it is an infectious disease, tuberculosis can be spread by proximity to an infected person. The germ can be injected into the air during a cough or sneeze. Indeed, millions caught it and died just that way around the turn of the twentieth century. Fortunately, there are now vaccines that can help prevent the disease, and therefore curtail any spread. The most common vaccine, named after its developer, is Bacille Calmette-Gu�rin or BCG. However, in many countries around the world vaccination is not routine. Consequently, several treatments are still in widespread use for both Latent TB and its active form. Latent TB is treated with antibiotics used to kill the infecting organism. Since there are different strains of the bacteria, often more than one drug will be used simultaneously to combat the illness. Sadly, there are forms called Multiple Drug Resistant Tuberculosis and Extensively Drug-Resistant Tuberculosis, which do not respond to the standard drugs. In these cases, physicians employ a specialized regimen of treatment which is only required in about ten percent of all cases.